Passengers who walked away from the fiery Aeroméxico crash are thankful to be alive but a safety expert on Wednesday said it was “no accident” that everyone aboard the jet survived. 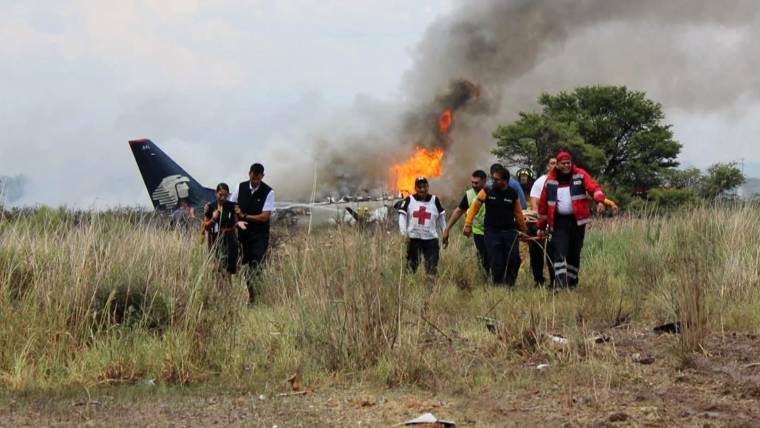 The aircraft attempted to take off in heavy rain during a storm Tuesday afternoon in Durango, Mexico, but crashed into grass near the runway and skidded to a stop before catching fire. The plane’s pilot, Capt. Carlos Meyran, suffered the most serious injury: a lesion that required surgery. Some survivors had burns on a quarter of their bodies, according to a local health official. “I feel blessed and grateful to God,” said Jackeline Flores, who escaped with her daughter as the Embraer E190 quickly filled with smoke and flames. Both of its engines were knocked off and it plowed through scrubland before coming to a halt 328 yards from the runway, he told reporters. “The E190 flight deck is very modern and has all the bells and whistles that will shout at the pilots if there’s a mechanical problem or they make a mistake configuring the plane for takeoff,” he said.